State Of The Art Vacation Home With Professional Theater Room Features A 150-Inch Projection Screen, 4K Theater Projector, Surround Sound, And Leather Reclining Seats For 10. The Games Area Features A Multi Arcade, PS4, Xbox One, And Two Comfortable Leather Gaming Chairs. 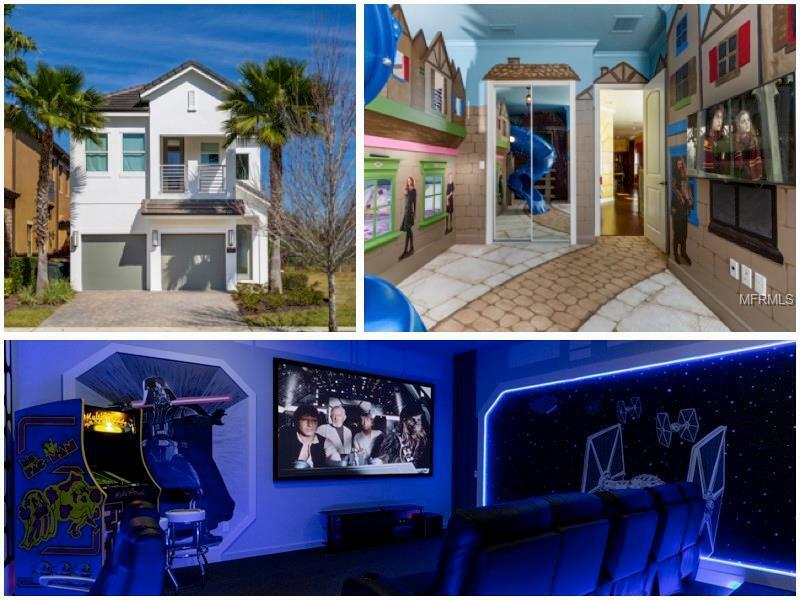 The Young At Heart Will Appreciate The “Magical Wizard” Themed Bonus Room With Pool Table, Along With Another Magically Themed Bedroom With Your Own Slide. The Home Has An Abundance Of The High-End Upgrades That Includes A Fully-Equipped Kitchen With Stainless Steel Appliances, Double Oven, Double Warming Trays, Built-In Wine Fridge And High-End Cabinets. Open Up The Sliding Glass Doors To Enjoy The Large Oasis Style Salt Water Pool With Spillover Spa That Overlooks Breathtaking Views Of The Jack Nicklaus Signature Golf Course. The Home Come With 5 Large Bedrooms And 5 1/2 Baths, One If The Master Suite Is Located On The First Floor, With High-End Décor And The Connected En-Suite Bathroom Has A Custom Walk In Shower, Clawfoot Stand In Tub, And A Two Sink Vanity. Located Within The Gated Community Of “Kingwood International’s” Reunion Resort. Just Minutes Away From Walt Disney Parks And The Other Major Orlando Attractions, Some Of The Best Beaches In The World And Orlando International Airport. Just Some Of the Resort Amenities Include 12 Community Pools, 3 Signature Golf Courses (Palmer, Watson, Nicklaus), Multimillion Dollar Water Park, 7 Onsite Restaurants, 2 Golf Pro Shops, Six Hydro-Grid Clay Tennis Courts, A Full-Service Spa.